Seeing as how Martin Luther King Jr Day was Monday, many Americans had themselves a long weekend before returning to work on Tuesday. Filipino fighter Manny Pacquiao, however, appears to have had the fullest, most eventful weekend imaginable. On Saturday night, Pacquiao faced off against Adrien Broner for his WBA welterweight title. He won a one sided decision, but not before hurting his cornea in the process. According to ESPN, the injury came when tape used to wrap one of Broner’s gloves ended up scratching one of Pacquiao’s eyeballs. Although word spread that Pacquiao might have a serious, career ending injury, it was reported by Pacquiao’s publicist that the fighter was treated by a doctor on Sunday and told to get the eye treated further only if the ointment Pacquiao was given didn’t work. 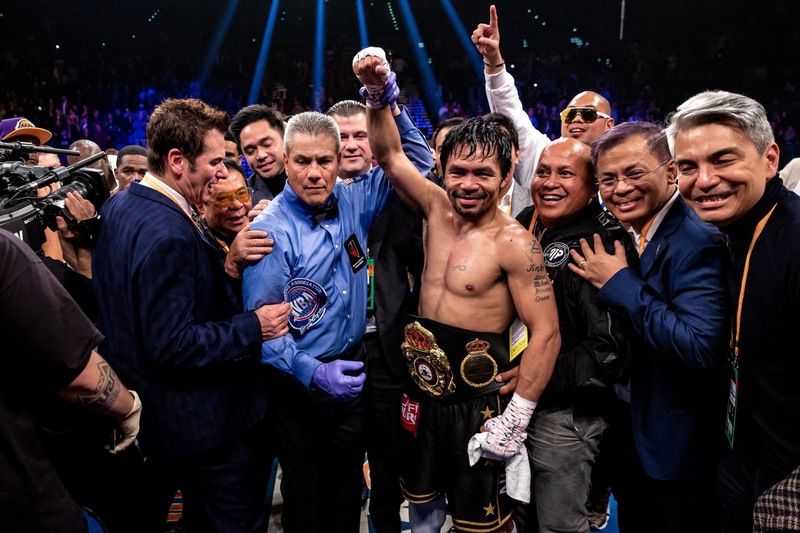 The eye injury may prove to be nothing more than a nuisance, but Pacquiao ended up with other things to worry about as the weekend pressed on, for his Las Angeles house was broken into. Pacquiao’s publicist said the matter is being looked into. It’s also reported that the break-in occurred Saturday night, the night Pacquiao fought Broner. To round out the weekend, Pacquiao bumped into arch rival Floyd Mayweather Monday night at the Staples Center in Las Angeles. Both men were in attendance to see the LA Lakers play the Golden State Warriors. Pacquiao walked up to Mayweather and the two shared a quick greeting. This with much speculation as to whether or not the two men will once again meet in the ring. Their first (and, up to this point, only) boxing encounter broke financial and viewership records, but was widely regarded as a dud, as Mayweather essentially coasted to a points victory. With both men now showing some wear and tear, however, there is some argument that a second fight would be closer than the first. Add in the fact that Pacquiao fought Mayweather while suffering from a shoulder injury and perhaps more people will find the prospect of a rematch interesting. For the time being, however, Mayweather claims to be retired (he just emerged victorious from a brutal, one sided, one round beating of Japanese kickboxer Tenshin Nasukawa in an exhibition bout) and Pacquiao, who is also a senator in his homeland, will be returning home to the Philippians. Yet now that promotional problems between the two no longer exist, a rematch may be more likely – though neither man is getting younger. The post Pacquiao Scratches Cornea, Talks With Mayweather, Finds Home Broken Into appeared first on BoxingInsider.com.